Despite the widespread adoption of targeted temperature management (TTM), coma after cardiac arrest remains a common problem with a high proportion of patients suffering substantial disability. Prognostication after cardiac arrest, particularly the identification of patients with likely good outcome, remains difficult. We performed a retrospective study of 78 patients who underwent TTM after cardiac arrest and were evaluated with both electroencephalography (EEG) and magnetic resonance imaging (MRI). We hypothesized that combining malignant versus non-malignant EEG classification with clinical exam and quantitative analysis of apparent diffusion coefficient (ADC) and fluid-attenuated inversion recovery imaging would improve prognostic ability. Consistent with prior literature, presence of a malignant EEG pattern was 100% specific for poor outcome. We found that decreased whole brain ADC signal intensity was associated with poor outcome (853 ± 14 vs. 950 ± 17.5 mm2/s, p < 0.0001). Less than 15% total brain volume with ADC signal intensity < 650 mm2/s was predictive of good outcome with 100% sensitivity, 51% specificity and an area under the curve of 0.787. 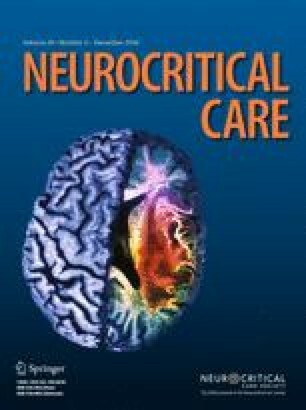 A model combining this ADC marker with non-malignant EEG and flexor-or-better motor response was 100% sensitive and 91.1% specific for good outcome following cardiac arrest and targeted temperature management. We conclude that in the absence of malignant EEG findings, combination of physical exam and MRI findings can be a useful to identify those patients who have potential for recovery. Variability in timing of imaging and findings in different modalities argue for the need for future prospective studies of multimodal outcome prediction after cardiac arrest. The online version of this article ( https://doi.org/10.1007/s12028-018-0559-z) contains supplementary material, which is available to authorized users. MBB analyzed the MRI data and was involved in statistical analysis, study conception and design, and primary drafting of manuscript. BMS, KRA, GVH were involved in acquisition of clinical data and critical revisions of the manuscript. APL interpreted the imaging data and critically revised the manuscript. JWL analyzed the EEG and MRI data, critically revised the manuscript, and was involved in study conception and design. Matthew B. Bevers reports a grant from the American Academy of Neurology, personal fees from Oakstone publishing, personal fees from DynaMed LLC, all outside the submitted work. Benjamin M. Scirica reports Grants and personal fees from AstraZeneca, grants from Daiichi Sankyo, grants and personal fees from Eisai, grants and personal fees from Gilead, grants from Novartis, grants and personal fees from Merck, grants from Poxel, personal fees from Biogen, personal fees from Boehringer Ingelheim, personal fees from Boston Clinical Research Institute, personal fees from Covance, personal fees from Elsevier Practice Update Cardiology, personal fees from GlaxoSmithKline, personal fees from Lexicon, personal fees from NovoNordisk, personal fees from Sanofi, personal fees from St. Jude’s Medical, other support from Health at Scale, all outside the submitted work. Kathleen Ryan Avery, Galen V. Henderson, Alexander P. Lin have Nothing to disclose. Jong W. Lee reports Contract work with SleepMed/DigiTrace and Advance Medical, grants from NIH, all outside the submitted work. All procedures performed in studies involving human participants were in accordance with the ethical standards of the institutional and/or national research committee and with the 1964 Helsinki declaration and its later amendments or comparable ethical standards. The current study was approved by the Partners Healthcare Institutional Review Board. As a retrospective study, it was approved with waiver of informed consent.